4 big-name stars, 1 small-aiming movie; some tedious “old fogie” comedy like we’re used to; some of the usual prostate/medication-needing/heart problem-having/afraid-of-getting-old gags with some touching moments in between; add in some formulaic portrayals of the expected cultural disconnect that old people are supposed to exhibit in movies – even though quite a vast number of elderly people today are adapting rather well to a new age of ipods, cell phones, and tablets – and you have this movie, a movie that would rather stay in familiar territory and give us the campy, old feeling of backwards-but-still-useful elderly people with hang-ups from years earlier instead of offering anything more substantial. So there...I think I’ve summarized Last Vegas pretty well. “Billy” (Michael Douglas), “Paddy” (Robert De Niro), “Archie” (Morgan Freeman), and “Sam” (Kevin Kline) are old farts who, through a series of disappointments in their personal lives, get together for a bachelor party in Vegas. Billy wants to marry “Lisa” (Bre Blair), but when the four encounter a nightclub singer named “Diana” (Mary Steenburgen), they find history repeating itself while moving forward into uncomfortable self-questioning territory that will either make or break certain friendships. The plot centers around these friends as it takes us from their childhoods in New York to their later years when all of their friends are dead or dying and their families see them as ailing, ready-to-keel-over, medication-dependent old bags (yes, the movie puts that much emphasis on their age and health woes, even when doing so is totally unnecessary and does not advance the story). As stated, the cultural and technological disconnect is present—complete with references like: “I looked it up on the Google” and big, pronounced button-pushing of old-school cell phones. Did we really need more of that? Although much of it tends to feel petty, long, and rather awkward, there are some funny jewels here and there. And many of those jewels reflect emotional vulnerability and the occasional inkling of intelligence in the writing that, at times, makes us say that it did exactly what the film aimed to do. Kline and Steenburgen give the most respectable performances of anyone. 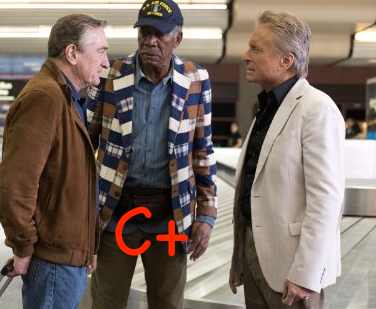 It’s nothing special, and the way it repeatedly stretches its drama can be tedious and puts a beating on its pacing, but the overall conclusion to be reached is that Last Vegas does hit a few marks that make it worth the watch for fans of the stars.